I hope Diaby shines, his price will go up!!! First off I’ll tell you what my thoughts are and I know you won’t agree….. The player once dubbed ‘The New Vieira’ is nothing like the old Paddy we know, love and miss so desperately in the centre of our midfield. Diaby does bare some resemblance though, but in stature only. During a few of our games he has shone, during others he has been lost in my opinion. I don’t think he knows if he’s Arthur or Martha in the world of football. Why oh why can’t Diaby get his brain and feet to work together in the same game. Why does he bomb forward like a headless chicken but not realise when danger looms, why can he not at that time play the pass just at the right time to prevent him losing the ball???? WHY? It’s clear to see he has the ability and at 24 years old, should he not be playing so much better and more consistently than he does?? Right now I wouldn’t be sorry to see him leave but will this World Cup change my mind and maybe the minds of others? Will the manager of France play Abou in the position he is best played in, in fact, will he play him much at all? Is the way Diaby performs down to where he is being asked to play?? Who is he then? Why did our boss go and buy him?? Born in Aubervilliers, a little place near to the capital of France he started out playing for football for his home town’s side. He was soon snapped up by a local semi-professional side, Red Star Paris. All before he was thirteen years old. At the same age, he moved to his first ‘big club’, signing a youth contract with Paris St-Germain. In 2002, things changed, he signed for Auxerre and helped win the under 16’s the national championship the same year – his then coach Christian Henna, described him as a “very good technician, elegant, quick”. Diaby signed as a professional at Auxerre in the 2004/5 season and played in seven matches the following season and six in the first half of 2005–06. His first match for Auxerre’s first team came as a last-minute substitute against Rennes on 14 August 2004. Two years later, Diaby now being twenty years old, Chelsea came a calling…. He said thanks, but no thanks, to the money bags football club in London. 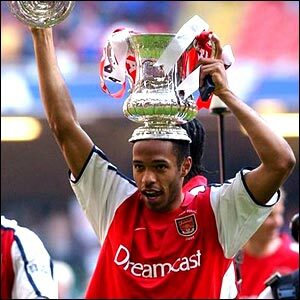 Instead, he signed for the red and white of Arsenal…. On 1 April 2006, Diaby came off the bench to score his first goal for us in the 5–0 thrashing of Aston Villa, after being set-up by fellow Arsenal newcomer Emmanuel Adebayor. The following month, Diaby suffered a broken leg and a dislocated ankle during the game at Sunderland..
January 2007, Diaby made his return. He was a late substitute in the 6-3 drubbing of the dippers in the League Cup… December 2007 he scored in the Champions League and again the following season in the same competition, again against the dippers. His first Premiership goal came during the following season against Aston Villa and to be fair, he’s often popped up with the odd goal or two…. Last season, Diaby started life on the bench but was soon asked by the boss to play on the left side of midfield in the new 4-3-3 formation but his natural position is as a box-to-box central midfielder, who is said to be ‘adept’ in both attack and defence. ‘Central midfielder’ – why is he played on the left?? Why did Arsene Wenger look at a central midfielder and then persist on playing him out wide??? Yes, he plays for France, if their manager was not Domenech I might think differently, but right now he seems to be on a one man crusade to destroy the French National Football team…. So, Is Abou Diaby good enough to be in our first team? Is he just a squad player? OR, is he best just sold and let another club worry about it? ?